THE MARTIAN LEGION: In Quest of Xonthron by Jake "Buddy" Saunders from Russ Cochran Publishing is the most incredible ERB-related book and collectible I have seen in the 65 years I've been collecting and reading Burroughs. There was an amazing amount of research put into this labour of love. This gartgantuan over-sized, quarter-of-a-million-word volume is beautifully designed by Zavier Leslie Cabarga and is lavishly decorated with over 130 illustrations by Tom Grindberg, Mike Hoffman, and Craig Mullins -- many of them in full colour and spread across two pages. Accompanying thoat leather-bound book is a package of related collectibles including a rare Martian coin by Joe DeVito, ownership certificate and personalized registry. 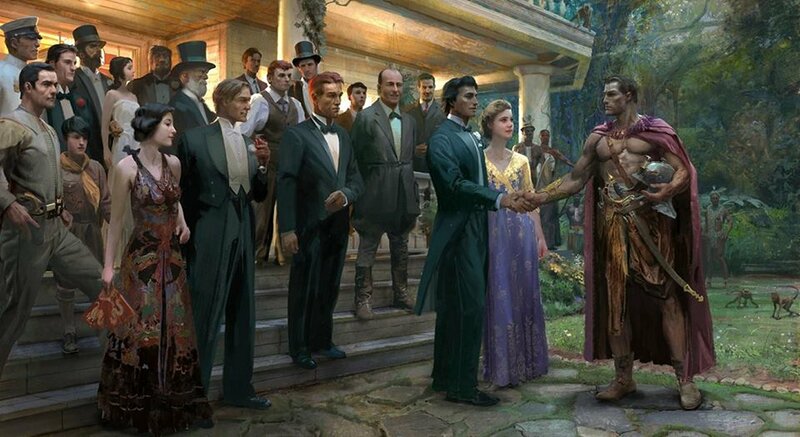 The opening contact of Edgar Rice Burroughs and John Carter with the author (indirectly) and the means of relaying this tale to us is worthy of the various contacts that John Carter made with his nephew ERB in the original Mars series. The author does an excellent job of bringing the reader up to date on Martian customs, societies, cultures, history, and races. We share these learning experiences with the Legion members as they are clued in along the way. The action and plotting are very much in the style ERB with parallel action and many cliffhangers. Adding to the appeal of the book is the inclusion of sections such as Introductions, Quotations, Prologue from "Edgar Rice Burroughs", Postscripts and Afterwords, extensive Notes, Bios, and Reference Index. Traditional pulp-type chapter titles and the multitude of relevant illustrations throughout hold the reader's interest and fire the imagination even further. It is no small task to bring together the main characters from ERB's many fictional worlds, but Nebula award nominee Buddy Saunders is more than up to the task. Thrown into the mix is a team of other main pulp characters of ERB's day. Introduction of the skills of these famous pulp characters adds another dimension and power to the Legion that John Carter has enlisted to save Barsoom: The Shadow clouds minds, Carson Napier provides access to advanced technology, Doc Savage and his crew provide manpower and good ole '30/'40s weaponry and smarts, Abner Perry and David Innes bring their knowledge of Pellucidar, H.P Lovecraft and Fu Manchu add a touch of the macabre, Tarzan's son Korak, provides savage jungle savy, and Tarzan's young son Conan, provides a great sounding board and a chance for the reader to learn things via his POV. Burroughs goes along on the mission to document everything and to provide miitary experience. Nearly all of the most popular Barsoom characters are brought into the story, including John Carter and Dejah Thoris and their offspring, Tars Tarkas, Woola's calot offspring, Ras Thavas, Tardos Mors, Phaidor, and the rejuvenated therns. Much of the action is driven by the advanced mind of Ghek the Kaldane and the crazed son of Matai Shang, Hekkador Klee Tun. * and our reliance on scientific and technological advances to save the planet. The choice of cartoon caveman Alley Oop and his mate is perhaps a bit unusual . . but much more so is the addition of American evangelist Billy Sunday, Jr. Sunday spends his time converting the Legion and the Martians to his ancient Earth religion. This results in the insertion of continual Jasoomian God, Bible and Satan references. His efforts, as well as many of the others -- surprisingly including Tarzan and Jane -- to place yet another religion on Barsoomian society which has already suffered from so much from false gods worship is a bit bewildering. Probably not a choice that atheist ERB would agree with. ERB is part of the action throughout -- never without pen and paper -- and recounts the incidents "through the nib of my pen." The narration features many such amusing quotes, by ERB and others. Colourful vocabulary and the many references to events, axioms, and items from ERB's day are also fascinating: Rube Goldberg, Packard headlights, Tommy guns, Conan's Red Ryder watch, ERB's actual office staff, Colt revolvers, old Imperial measurements, pulp fiction, Tarzan films, plugged nickels, Houdini, Whiskey Jack (ERB's Idaho bronc), Gene Tunney, scalping, Bible quotes, Nazis, Gibson Girl, Foulds Tarzan miniatures, etc. The problem that many unimaginative followers of the original tales . . . that Mars is now known to be a dead planet . . . is solved through interdimensional transmigration and time travel. Both devices play major roles in the novel's very complex plotting. The story is long, but never lags. Confusion enters at times, but eventually all is explained. The book is extremely well written and researched. The writing style, descriptions and vocabulary are worthy of the master. Fans of ERB -- and indeed, those new to the genre -- should feel very comfortable with the writing style. In fact, Saunders even expands upon the ERB style with in-depth descriptions of Barsoom flora and fauna, many parallel and converging plots, and a multitude of twists, turns, surprises, foreshadowing and cliff hangers. Apparent discrepancies in the plotting are explained by revelations further along in the story or in a few cases, by the author's reminder that this is an Edgar Rice Burroughs world from an alternate time and dimension. There has been a many-decades wait for a worthy sequel to the ERB Mars series -- the launch of The Martian Legion has made the wait worthwhile. 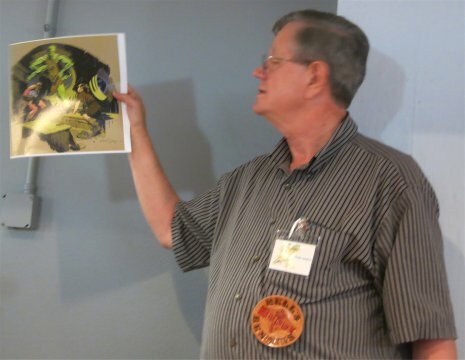 Author Buddy Saunders proudly sharing treasures from his Martian Legion project.